Here is something that may be of interest to The dear readers. Assuming that the The dear readers are not already aware! von Peter himself stumbled across this find and immediately the devious mind began churning scheming thoughts. Locally there are ongoing ruminations regarding a possible trip to Europe … and this is distinctly in Europe. L ‘Hotel de Hercé in Mayenne, France is that “thing” of interest. “Stay in one of our beautifully decorated 18thc panelled guest rooms. Tour – Book guided day tours, or inclusive holidays & experience the beauty, history food & wine of Pays de Loire. Relax – The two large 18thc salons, & garden are open to guests to relax read, play games, or socialize over a glass of wine. SHOP – wargames miniatures – painted armies and units for sale. And there’s more with historic tours of the area, shopping tours etc.​ It is not impossible that a wife might very plausibly find some of the non wargaming offerings in a picturesque spot in France to be of interest. Hmmm. There is also a L ‘Hotel de Hercé facebook page for further information. The hotel has a tag line “Stay – Tour – Relax – Wargame”. So the awkward question remains … why was von Peter himself not told?! And when might Fraulien von Peter herself be told?! Brew-ha-ha. A brand new instructional video for the Napoleonic rules General d’Armee starring the rules author Dave Brown has been created. At the time of typing von Peter himself has only viewed a few minutes of said production but what was seen was well worth the time invested. The tactical options available in various situations were discussed as well as the expected rules discussions. From the viewing so far – a big fat “vPh Recommended”. Our regular team are joined in the studio by international wargaming celebrity Dave Brown as they discuss Richard’s recent visit to Historicon, the demise of the Summer Special and this episode’s Big Issue, BIG Battles. Unlike the video above of which von Peter himself has viewed only a few minutes this podcast is totally unlistened to by the same von Peter himself. However, based on the experience of the preceding nine episodes the risk of advertising episode ten and it turning out to be a turkey does not seem that great. Dave Brown is certainly getting around – see the prior item. But then what else would one would expect from an “international wargaming celebrity”. 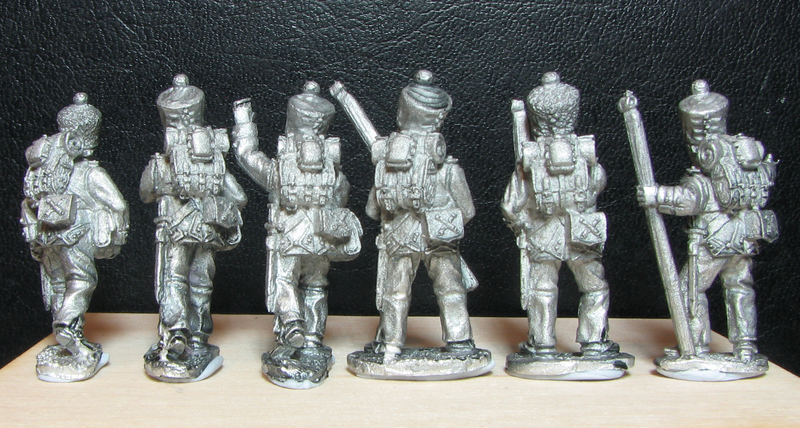 The latest is that the gunner packs have now found their way on to the Calpe Miniatures website. The dear reader can now see pictures – front and back – of all the packs and order them online. Sadly only one of the packs is shown in a painted state as not only do the painted figures provide some tasty eye candy but they also provide an excellent uniform guide. Click here for direct access to the wee chaps. 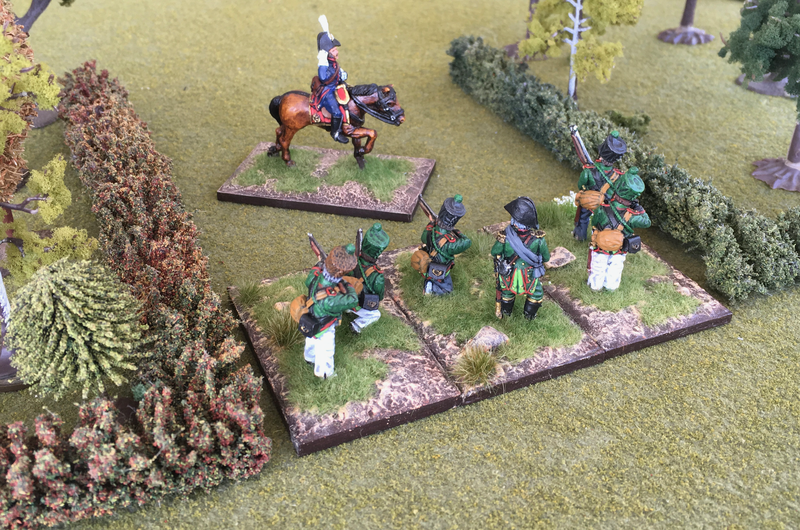 The image above is ah … um … “backed up” from the Calpe Miniatures website to add a little colour and class to the proceedings here. von Peter himself could not resist including the image below as well because it shows off the detail to be found on the rear of figures. As told in several of the preceding posts Calpe Miniatures have released their Saxon Foot Artillery … though their website is yet too catch up! von Peter himself already had five packs of gunners in hand – see SA stands for Saxon Artillery – and now the NCOs, officers and a few “others” have arrived so that finally it will be possible to create the gun crews for a battery … or two. It is these NCOs, officers and “others” that are the reason for this post. When selecting the latest artillerymen von Peter himself foresook his default preference for uncovered shakos. These all have covered shakos to reduce the bling and represent what was probably the more likely occurrence of covered shakos being the more common in the field. While marvelling at the figures please remember that they are presented in larger than life size … depending on The dear readers device of course! ‘Click’ the photos for a larger and clearer image. 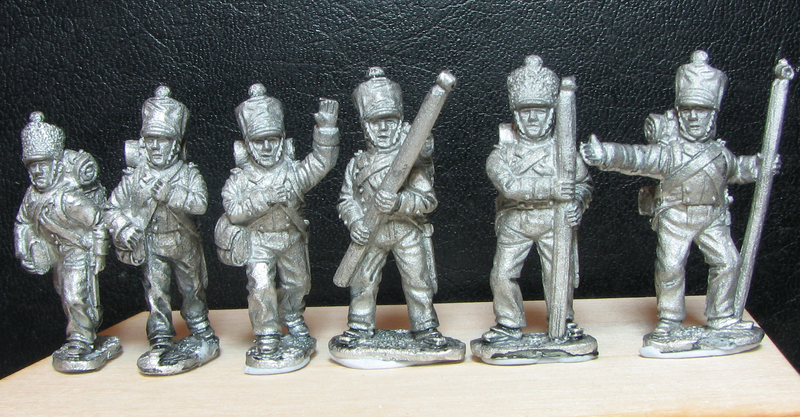 Above: SA19 – Battery command – mounted officer, two foot officers, sapper, drummer, Feldwebel. (only available in covered shakos). FYI – the images do not do justice to the mounted officer. The feeling in Neu Schloss von Peter is that a Saxon foot battery will most likely be the next unit to be painted. But there are still several non unit paint jobs – leaders, limbers, horses etc – sitting partially completed on the painting table. The order of anything being painted truly is a lottery. And there has not been a lot of painting happening recently. Perhaps it’s time to don a hair shirt until the behaviour improves. Today – Sunday 2 September – is the day that New Zealand celebrates that most venerable of institutions … “Fathers Day”. Not that von Peter himself is biased at all! 😊 Most importantly the day provides an opportunity to amass treasures for the hobby. von Peter himself can happily pronounce himself pleased with this years efforts. 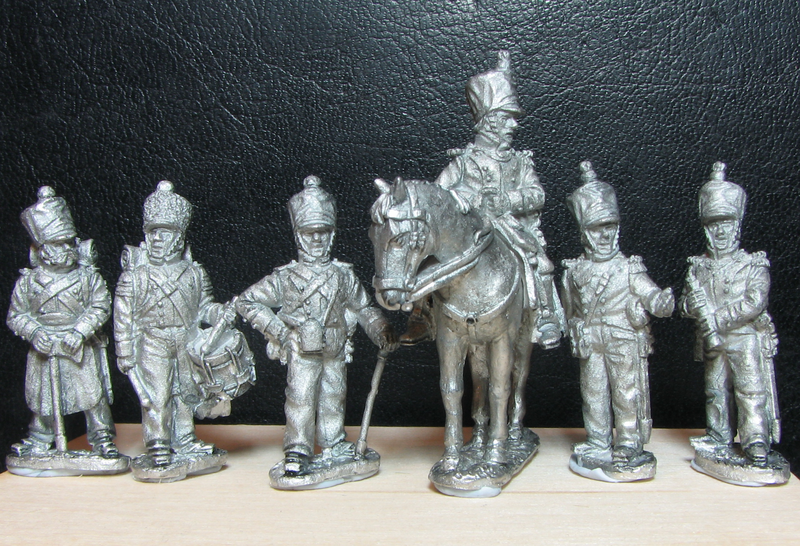 SA19 – Battery command – mounted officer, two foot officers, sapper, drummer, Feldwebel. (only available in covered shakos). Three packs (SA15, SA17 & SA19) were immediately requisitioned. When put alongside the artillerymen already collected – see SA stands for Saxon Artillery – and the Saxon artillery pieces already purchased these packs will allow for the organising of a Saxon foot battery … or two. Perhaps a 6 pdr Saxon Foot Battery will be the next unit von Peter himself paints! The figures have been despatched. More will not doubt appear in these august(!) pages once the figures are in hand. ** Limbers etc are expected in the future. 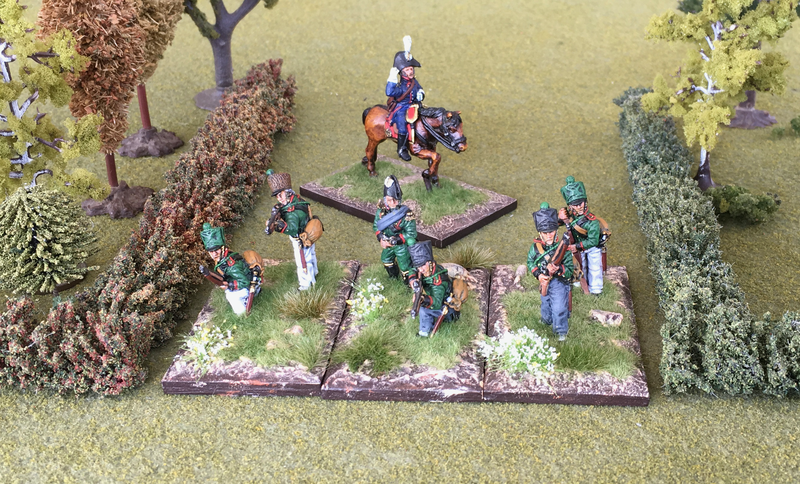 WARNING – Gossip: von Peter himself has reason to believe that work on the firing line Saxon Light Infantry is underway deep in the foundries of Calpe Towers. This is gossip of a most excellent nature as two battalions of them are required at Neu Schloss von Peter. Whilst documenting the Napoleonic Austrians under arms on his website von Peter himself realised that there was a deficit of a command stand to fit the historic organisation that was being recreated. This had come about because the metal had been collected without thought to represent 1st Amy Corps commander FZM Graf H. Colloredo. With the CinC stand being documented as FZM Graf H. Colloredo a command stand was required to represent Generalmajor Raigencourt who commanded a brigade in the 1st Division. No problem as it was nearly Fathers Day! An order to Front Rank Figurines – provisioner of articles Austrian to von Peter himself – was concocted. But it was a terribly skimpy order of only a few figures. For a package to be sent all the way from the UK to NZ surely it is only responsible to make it worthwhile? Therefore figures for ADCs – Austrian & Polish – were added. Oh and the figures for a Polish Foot Battery. Done. Order placed and apparently it has been despatched by Front Rank. Package impending. Naval & Military Press are constantly tempting von Peter himself with their books. And then they go and up the temptation with sales. It was all too much! The two books “Lobositz to Leuthen : Horace St Paul and the Seven Years War, 1756-1757” and “OlmuTz to Torgau : Horace St Paul and the Campaigns of the Austrian Army in the Seven Years War 1758-60” were on sale as a pair and caught the eye of von Peter himself. Whilst placing the order it was noticed that the book “The Battle of Minden 1759 : The Miraculous Victory of the Seven Years War” was available for a mere £4.79 so that was added to the ordering cart. Why not?! Unintentionally all three books focus on the Seven Years War in Europe. An omen? They arrived on the Friday prior to Fathers Day. They were in a box inside a Royal Mail bag that had been placed under the table on the back deck. Keela – that most notorious & dastardly French sympathising Irish Terrier – took an instant dislike to the bag and was growling and sneaking up on it in a most feral manner. Most amusing. No doubt the books will spend some time in the library before being read. And as an observation the two Horace St Paul books must be the heaviest books for their size that von Peter himself has ever happened across. Fathers Day – what a great idea. How long until Christmas? A quick public service announcement that most of The dear readers will already be aware of. But what can one do?! The chaps – and chapesses? – over at Karwansaray Publishers are running their annual survey on the hobby imaginatively yet accurately entitled “The Great Wargaming Survey 2018“. Welcome to the Great Wargaming Survey 2018 with an exclusive focus on tabletop miniature wargaming. Apart from rolling dice, there seem to be few things wargamers like to do better than discuss the state of their hobby. The purpose of this survey is to answer some of the questions that regularly come up in such debates. As before, the results will be published online only for everyone to read. As before, and thanks to our gracious sponsors, we have quite a few prizes to be won. Leave your email address at the end of the survey to be entered into the raffle. Entering the contest does not automatically mean we’ll subscribe you to any communication! That is a separate question which does not influence the results of the raffle in any way. As a thank-you for taking part, everyone who completes the survey will get a 15% discount code for the Wargames, Soldiers & Strategy / Karwansaray Publishers webshop. Though it does not apply to shipping costs, this code can be used for any (combination of) in the shop apart from our Premium, Combined and Digital subscriptions. Finally, filling out the entire survey shouldn’t take more than 5-10 minutes, and we’re taking responses until September 5th, 2018.
von Peter himself spent closer to five minutes than ten making his donation to the 2018 edition of the survey so it really is not a major investment of time. Apologies. The local headline editor is really getting out of control. Whilst not factually incorrect a trip to the eastern front may be required to tone down the sensationalist word compositing. This is after all a serious blog on a most wholesome hobby and as such headlines of a most serious nature are required. Anyways … on with the show …. The Royal Saxon Army welcomed the birth of the Jäger Korps in August 1809. Formed from professional hunters at a Company strength of 3 Officers, 1 Sergeant Major, 1 Sergeant, 11 Corporals, 6 Musicians and 100 Jägers the unit was considered to be of an elite status. Staying at home during the 1812 Russian campaign turned out to be quite a good call but with much of the 1813 campaign taking place over Saxony itself participation in that war was not to be avoided! And it was a hard campaign for all involved. By November 1813 the unit was down to 2 Officers and 41 Jägers. The unit was then expanded to battalion strength mostly with drafts from the line infantry which inevitably resulted in the loss of its elite status. 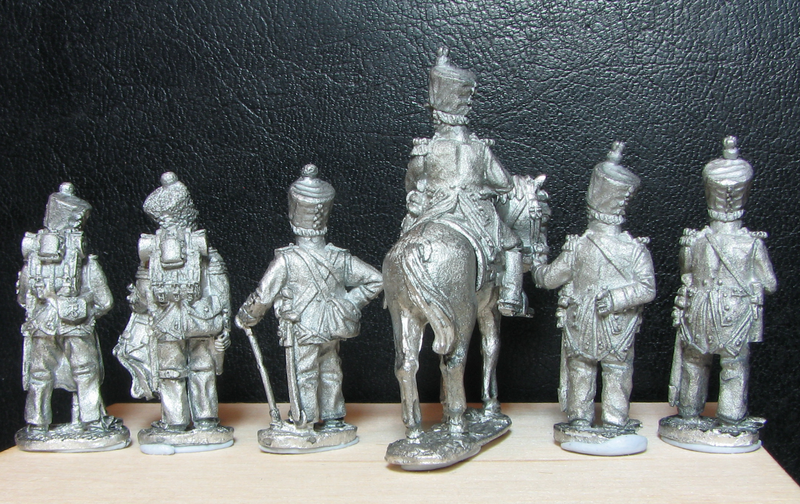 Being mostly interested in the 1813 campaign Calpe Miniatures have produced a six figure pack – S60 – to represent the unit whilst established at Company strength. An officer and five skirmishing jägers are provisioned. With a whopping six unique figures the unit was a joy to paint as a short & sharp exercise. The available options – grey or white overalls and a variety of headgear/colours – aided the interest of the job at hand. On the downside there was a bit of piping to track and paint. Not all of it is visible in the photos. Worryingly a quick review of the Saxon light infantry reveals a similar level of piping … and two complete battalions of them will be required! Thankfully as is their way Calpe have nearly all of the piping sculpted in relief so that all one has to do is take one’s time and try to create a clean(ish!) job. The red piping on the green is a pleasant colour combination which also helped. Calpe Miniatures Guides & Research on the Saxon Jaegers. Click the images for larger and clearer views. Above: za Jäger Korps of za Royal Saxon Army will fall back on zat Royal Saxon Army immediately! Schnell!! The battalion in question is the Saxon 1/Prinz Frederich August Infantry Regiment which was part of Generalmajor Mellentin’s 2nd Brigade … in Generallieutenant Lecoq’s 24th (Saxon) Division … which in turn constituted part of General de Division Reynier’s VII Corps in 1813. Calpe Miniatures of course with flag from GMB Designs. The new boys can be seen in the image below being bravely backed up by the other now veteran … and somewhat wary! … Saxon battalions under the stewardship of von Peter himself. Next up is the six figure Saxon Jaeger company. 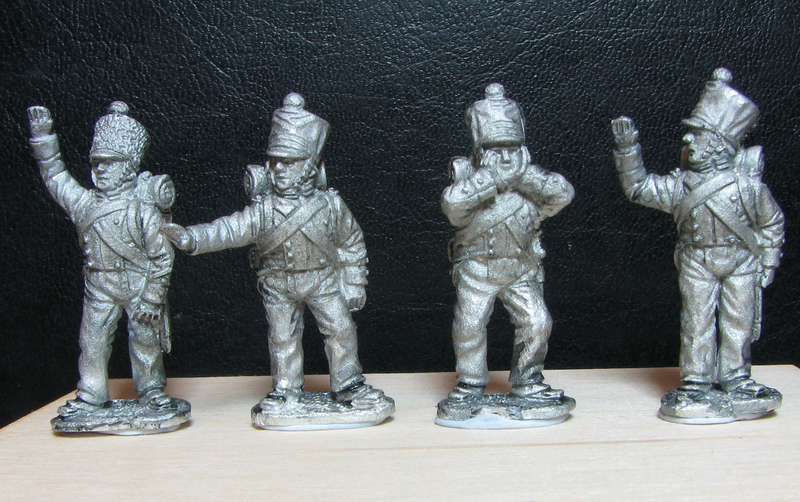 There were thoughts of starting a Prussian battalion but who can resist a mere six figure unit? And they’ve even been started. All six of them! 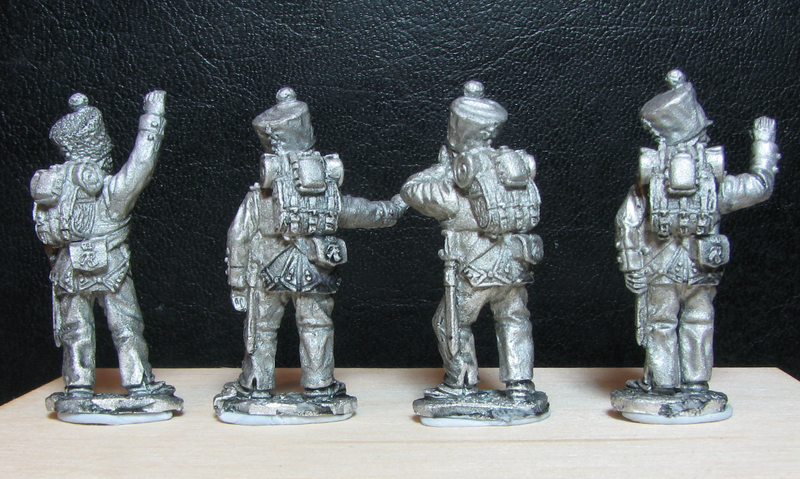 Well they’ve been cleaned up … an extremely minor undertaking … and undercoated. But still technically they are actually started! von Peter himself wonders how long they will take especially given all the other distractions on the painting table. It is no small matter to set the scene for a photo shoot so only a foolish man would not take the opportunity to snap a few more photos. There are still several units that require up to date or improved images for placement on the slowly developing web page of von Peter himself which runs in parallel this here blog. The lucky units this time around were the Austrian Deutsch-Banat Grenz Regiment and a commander. You can see these on the Napoleonic Austrian page of the aforementioned website. Please remember that one can partake of the advanced technology provided at no extra charge by clicking on the images to see larger and clearer versions. 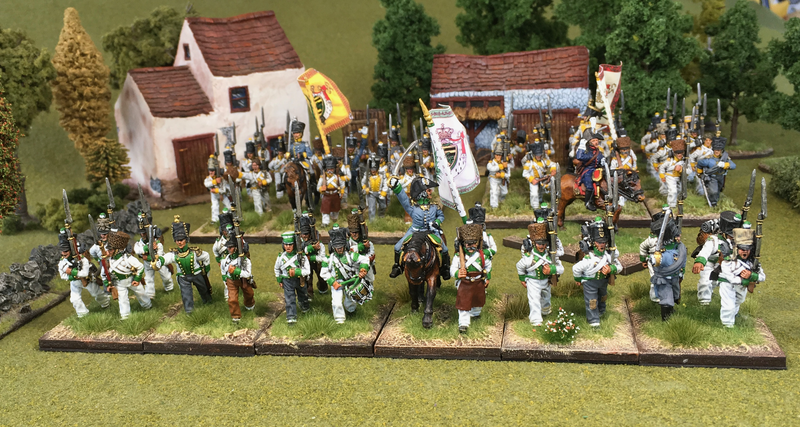 Another Napoleonic Polish battalion; Napoleonic Saxon command; a finally completed Napoleonic French battalion; Napoleonic Prussian command; a couple of Prussian Feldjaegers; Napoleonic Prussian 6 pdr limber … and the occasional civilian. And of course patience is reputedly a virtue!